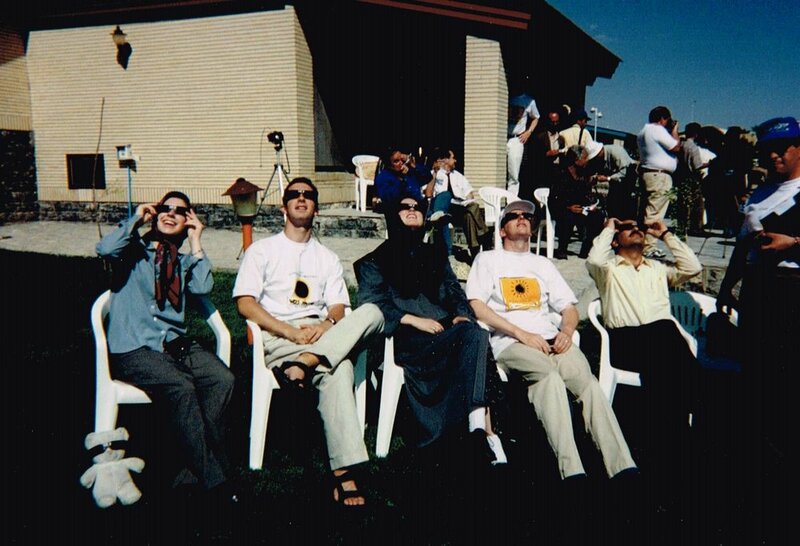 AIC's Director in the Huffington Post: "President Trump Just Broke the 'Spirit' of the Iran Deal"
A picture from my trip to Iran in 1999 to view the last total solar eclipse of the millennium with a group organized by Search for Common Ground. I’m on the left with the eclipse-ready teddy bear. A total solar eclipse passed through the U.S. mainland this past August and I had the wonderful opportunity to view it. It was, coincidentally, the very “same” eclipse I had seen in Iran eighteen years earlier. It’s called a saros: a repeating pattern of eclipses that happens every eighteen years, eleven days and eight hours, when the “same” eclipse appears one third of the way around the world. Typically, celestial wonders remind us that human beings and our politics and activities are insignificant in the grand scheme of things, but this eclipse had the opposite effect on me. Given the locations from which I viewed the respective events, I focused instead on how frustratingly little US-Iran relations had changed during the saros period – the continued lack of diplomatic relations and rampant mistrust between the countries. In a way, the saros pattern of eclipses reflected for me the obstinate way in which humans are unable to break from their own familiar historical and political patterns. When I visited Iran eighteen years ago, my younger self was confident that relations would improve quickly. As a sixteen-year-old aspiring astronomer, I was encouraged by the throngs of young women studying science that we met at universities in this supposedly conservative society. I was amazed by the chants of “we love America” that followed us everywhere (a far cry from the famous 1979 version), and I was heartened by the constant outpouring of kindness we received from everyone we met. With such a modern, youthful and warm population – most of whom were born after the 1979 revolution – I assumed that relations could only improve. The Iranian population hasn’t changed, with the vast majority still eager for rapprochement with the West. However, the familiar political patterns and cycles of distrust between the US and Iran continue to maintain the status quo. It’s said that patterns of history will repeat themselves if we fail to learn from the past, so it’s worth a brief reminder of the historical flashpoints between the US and Iran: the US overthrowing the democratically-elected Mohammad Mossadegh to re-install the authoritarian Shah Reza Pahlavi to power in 1953; Iranians rebelling against the Shah in the 1979 Islamic Revolution; the ensuing hostage crisis and breakdown of diplomatic relations between the US and Iran; US support for Iraq during the Iran-Iraq War, in which Iraq used chemical weapons against Iran; Iran’s ‘tanker war’ in the Persian Gulf against Iraq and nations supporting Iraq during the war. These and other historical events fomented deep mistrust on both sides. And yet, like a tragic comedy about a separated couple where one, but never both parties want to reconcile, Iran and the US constantly seem perfectly out of sync. When President Rafsanjani, a pragmatist, led Iran in the 1990’s, his attempts to repair a modicum of relations with the US were rebuffed by President Clinton who responded with crushing sanctions on the country. A course change in President Clinton’s approach later in his presidency was quickly reversed by a new US leader, President George W. Bush. He too rejected overtures from Iran in the aftermath of 9/11, and instead famously lumped the country into his so-called “Axis of Evil.” And while US policy could have changed early in Obama’s presidency had the circumstances in Iran been right, hardliner President Ahmadinejad was in power at the time, and his hostile rhetoric against the US and Israel made rapprochement untenable. It was only towards the end of Obama’s presidency, with a weakened Iran due to sanctions, and a moderate at the helm, President Rouhani, that the mere possibility of communication opened. Like an eclipse, everything had aligned just right in both countries to make an opening possible, and thankfully leadership seized the opportunity. The P5+1 hammered out a remarkable achievement with agreement on the nuclear issue; but, in a way, the deal was also remarkable for being the first time in nearly 40 years that the US and Iran had broken through the patterns of history and taken their first step towards a possible path to regaining a modicum of trust. In a sense, that was the spirit of the deal. Today, by breaking that most ephemeral spark of trust, President Trump, not Iran, has broken the spirit of the deal. While President Trump argues otherwise – that Iran has done so by failing to moderate its behaviors beyond the nuclear realm - that, of course, was never the goal, nor the spirit of the JCPOA. By refusing to recertify a deal that took not only years to be negotiated, but required such a rare historical moment to even bring US and Iranian sides to the table -- President Trump demonstrates that he is unable to break through historical patterns or learn from past mistakes. That he is willing, even eager, to bring us back to square one, or the political equivalent of celestial apogee of US-Iran relations. I still believe relations between the two countries will ultimately improve, thanks in part to the generation of young Iranians who will take over from the aging hardliners; and, I still hope that another alignment of US leadership might ultimately allow for a path forward with Iran. But today’s step backwards makes that future unfortunately distant. Many have noted that today’s actions will also have far-reaching ramifications beyond US-Iran relations. I won’t elaborate on those today except to note this: I hope to see a third total solar eclipse in my lifetime, and my goal is to see the “same” one that I have seen twice before. The next time I see that eclipse will be in 2035 when it crosses over Pyongyang, North Korea. Let’s hope the world by then has broken through the frustrating human “saros” of political intransigence.